If you can’t get out of bed for a morning workout, rearrange your daily routine and accommodate a lunch or evening session. If time is limited during the season, consider reducing your workout schedule, but not stopping it entirely. When you go on vacation, instead of counting the entire time as a cheat meal, bring along some protein shakes or meal replacements which you can mix into the enormous amounts of food you and your family will likely enjoy. The important thing is that you don’t stop because you can’t do everything. If you are traveling to visit family and friends, look for gyms in the area which allow per-session memberships and complete some of your routines during your downtime. Of course, you will want to spend time with the people you are visiting, but there will be times when you just want a break, and working out can be a great relaxation technique to help you clear your mind. Similarly, if you enjoy cardio, search social media for local walking or running groups in the areas you will be visiting. 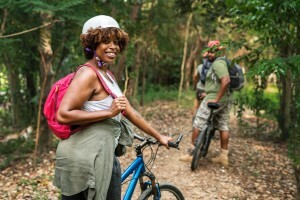 Not only can these be a great way to keep up with your exercise but you will also get a small tour of the area with some locals. The worst thing you can do during the holiday and cold season is to simply give up. If you returned home from vacation or the cold is starting to get the best of you, speak with a trainer at Athletic Republic Parkland by calling (786) 493-9609. With their expert knowledge, experience providing athlete training, and state-of-the-art equipment, Athletic Republic Parkland can help you stay on or get back on track to achieving your fitness goals.